We hopped on our bikes to finish what we started so many years ago. We were recharged and ready to rock! Amanda writes: So what’s with the new speed you ask? Well in recent months Andrew and I have been analyzing our travel over the years. We’ve slowed down. A lot. And I know that as we age our speed may decrease but I really didn’t want it to be significant. In the Fall while we were regrouping in Great Britain I worked hard at maintaining my activity levels. I tried to run but that ankle injury from Peru seems to be a nuisance, so I’ve been walking. I had an excess amount of energy to burn off while we weren’t cycling so I was consistently walking some long distances. And it appears to have paid off. We’re back to our pace of four years ago. Yes! On the 8th our first day we left the AirBnB in Mendoza before 9. The bike path out of town was awesome and it was packed with loads of people exercising; running, walking or cycling. There were some very nice bike lanes out of the city. We took one wrong turn and were on side streets and within 5 minutes a cop car pulled up beside us and said get out of here. Back to the main street we went. The cop car had metal bars on all the windows to protect the 3 cops inside. As we neared the end of town there was a Walmart. When the bike path ended we turned in a gravel road for a bit and had lunch and a little nap in the shade. Then we turned onto a busier highway for a climb which lasted about two hours. The heat was impacting us at that point and we took a few breaks and had a Gatorade. 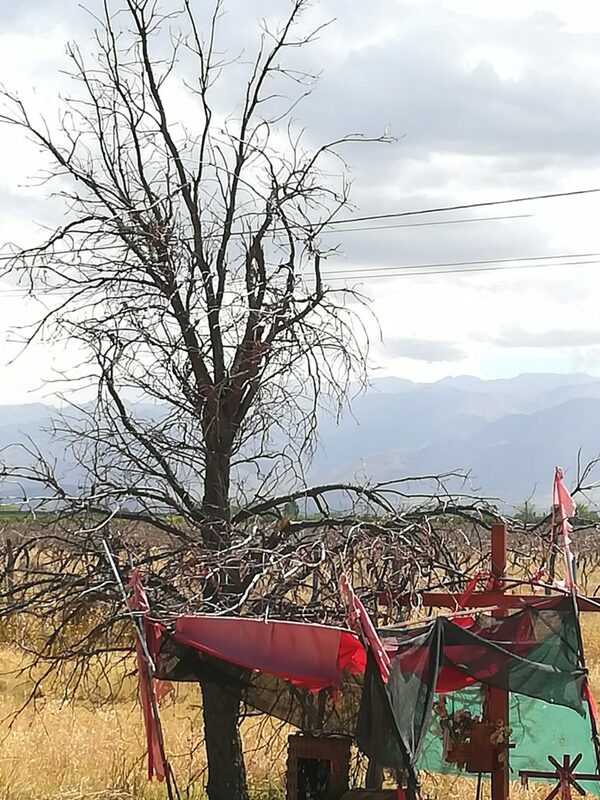 A Gauchito Gil shrine of which there are many in Argentina. After finishing most of the climbing we went into a small town and found a store and bought a 1.5 liter bottle of juice. Beer cost less but we didn’t think that would be a smart idea. We waited around a bit for a store to open after siesta and bought some meat for our dinner. 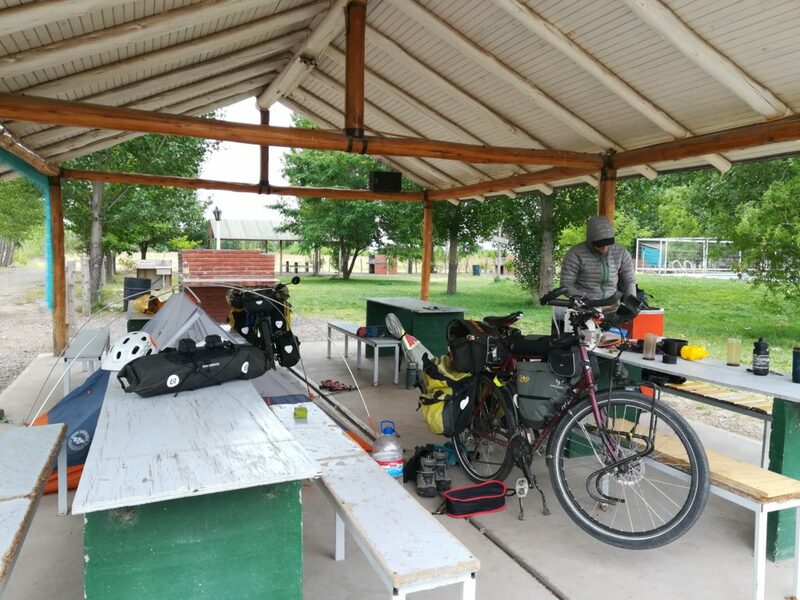 Then we cycled about 3k to the Municipal campground. Not a bad campground. We parked ourselves as far from others as we could. Lots of music and parties. As a first day on the road in sometime, it wasn’t half bad. On the 9th we left the campsite in Tupungato and headed onto the road. As we neared our campsite we stopped at a little road-side store for a drink and a snack. I was pretty tired at this point. A nice couple who we chatted with bought us two sandwiches which was a really nice gesture. Great sandwiches too and it meant we didn’t have to have bread and jam for lunch tomorrow. The campground was awesome and clean and private. On this night Andrew and I discovered some concerning wear on his backside that could develop into a problem if not taken care of. I guess we’re back to paying attention to our bodies and how the heat impacts us. Our covered camp spot. We had all four picnic tables to ourselves. On the 10th we had a great sleep in and a leisurely departure. I found this day hard because of the work required to prevent being killed by cars was exhausting. I was so tired by the time we arrived in the city. Maybe part of it too was the 100+k but I was done! We checked in to a place Andrew had arranged and went for a walk to find some food. We enjoyed our little sightseeing and returned to the hostel to get some rest. 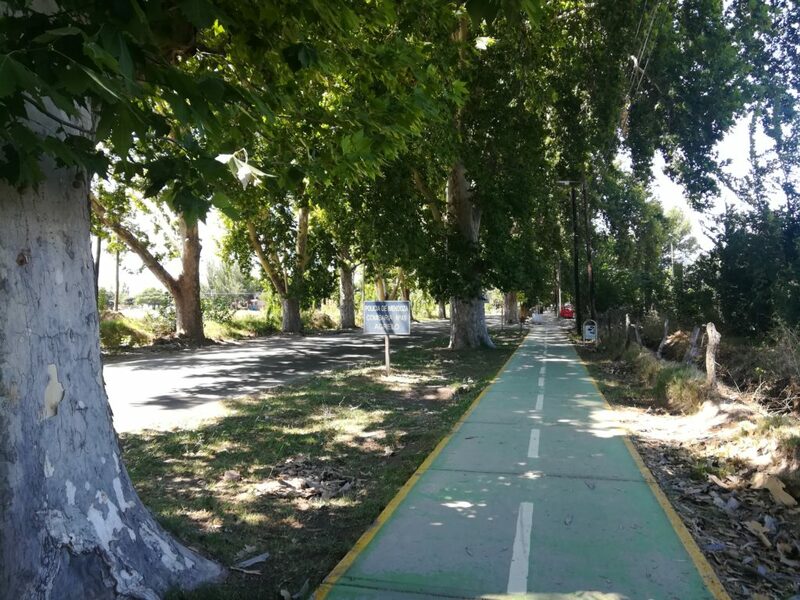 January 8, 2019 The route in the city starts on a great bike path. Lots of bike route options as you leave town. When the bike path ended we turned on a gravel road for a bit. Then we turned onto a busier highway for a climb which lasted about two hours. Then we popped into a town to grab a couple of things and cycled down a gravel road to the campground. January 9, 2019 We left the campsite and headed onto the road. The entire day was on paved roads some with a shoulder. The terrain again was very gradual and manageable. January 10, 2019 This day was 35k uphill and then mostly downhill. The wind was in our favour so it helped. The road was paved but had no shoulder and the traffic was heavy and stressed me out. January 8, 2019 We stayed at the municipal campground for 250 pesos. Not a bad campground. Hot showers in the morning and toilets. January 9, 2019 Arrived at skookum campground that was 350 pesos per night. Pool, hot showers, clean toilets, covered cooking area and picnic tables. Great spot and quiet. January 10, 2019 We checked in to a hostel Andrew had arranged. I think it was 1200 per night for two people. Shared room and shared washrooms and showers with wifi. Sure sounds like you are both quite fit for amount of biking you are doing! Yes take care of any sore spot on your bodies as the heat and friction will make it worse…nice little camping spots…looked pretty clean too!